Watch the video above to the two-minute mark (and beyond) and we guarantee a brilliant start to your Friday. “Enter Sandman” indeed, Metallica. Look past the flames and thrust, however, and you will see a parachute test in action that could help spacecraft land safely on Mars one day. This is an undated “rocket sled” test of the Low-Density Supersonic Decelerator, a technology aiming to be a more advanced way to bring spacecraft to Mars besides the 1970s-era Viking parachutes that were used as late as the Curiosity mission. And supersonic flight tests of this technology will take place this year and next, according to NASA. The technology could be used on spacecraft as early as 2018, the agency added. “One of the tests on my LDSD project, which combines the Navy version of a Blackhawk helicopter, a giant 110 foot parachute, 3000 pounds of rope, a very big pulley, four rockets, and a railroad track in the desert. The test successfully uncovered a design flaw in the parachute before we flew one like it on a much more expensive test — which is exactly what this test was for,” wrote collaborator Mark Adler (a fellow at the Jet Propulsion Laboratory who was a mission manager for the Spirit rover) on Google Plus. As part of this project, NASA is testing three devices. The first is a huge parachute (30.5 meters, or 100 feet) that will deploy when the spacecraft is at about 1.5 to 2 times the speed of sound to slow it down. At faster speeds, NASA also plans inflatable aerodynamic decelerators, which it describes as “very large, durable, balloon-like pressure vessels.” These devices are being tested in two versions: six-meter and eight-meter (19.7 feet and 26.2 feet). They are designed to balloon around the spacecraft to slow it down from 3.5 times the speed of sound to at least twice the speed of sound, if not lower. “All three devices will be the largest of their kind ever flown at speeds several times greater than the speed of sound,” NASA stated. The project is a NASA technology demonstration mission led by the Jet Propulsion Laboratory. This test and similar ones were conducted at the conducted at the U.S. Naval Air Weapons Station at China Lake, Calif. More videos and information are available at LDSD’s webpage. 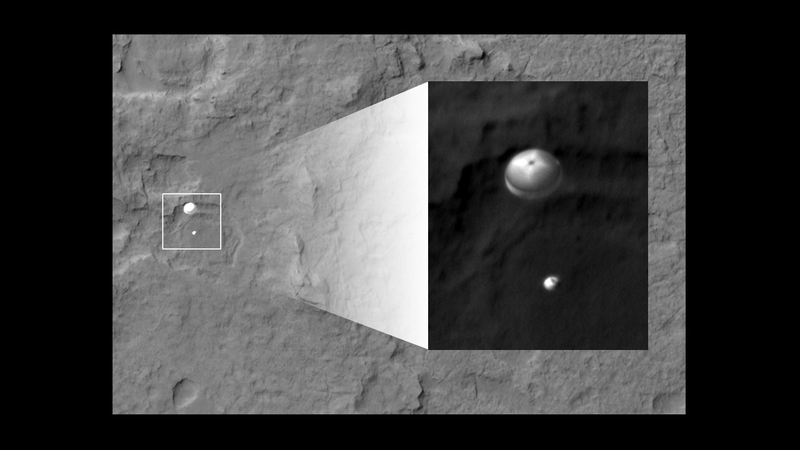 Huge hat-tip to @marsroverdriver for highlighting this on his Twitter account yesterday (Thursday).